With escalating power bills and so much talk of renewable energy millions of people are thinking about solar power these days. Harnessing the sun's energy makes sense because it is clean, green, and saves money in the long run. But the reality is that the cost involved with installing panels and collectors is still out of reach for the vast majority of homeowners. Fortunately there are some cheap and easy ways to make the sun work for you. Passive solar means simply using or blocking the sun's rays to heat or cool your home. This means that using your window coverings wisely can save you a ton on your power bills. Simply closing or angling your blinds to keep direct sunlight out can drop the interior temperature by 10 degrees. Try closing the window coverings on the south side of your house when you leave for the day during the summer months. Without the sun's hot light shining in the windows, your air conditioner won't have to work as hard. And in the winter of course doing the opposite can help heat your house. There tons of great looking blinds, awnings, and window films to help you harness or block the sun's powerful rays. Lighting the exterior of your home used to be tricky because you had to find a way to get power to the lights. But with the advancement in renewable power technology, these has gotten a lot easier. Solar garden lights, security lights, and area lights now come completely integrated with panel, battery, electronic eye, and lights. Installation is usually as easy as hanging a picture and the prices start at less than $50. So whether you are trying to put some accent lights in your garden, shed some light in your tool shed, or trying to brighten those dark steps, lights powered by the sun are a great alternative. These days we carry so many electronic devices around with us it kind of feels like we are a walking Radio Shack. The hardest part is figuring out how to keep these things charged. Now there are cool-looking portable solar chargers that will keep your iPod or blackberry running in a pinch. They are lightweight, folding, and very durable to handle the rigors of travel and outdoors situations. And if you are indoors and in need of a quick charge most of them will work by simply them putting near a window. For your outdoor spaces, solar fountains lend a soothing touch to any setting. All they require is a little water and a sunny spot and they can surround you with pleasant sounds or keep your pond aerated. Solar lamp post lights lend a nice touch to any entry area and tell your arriving guests you have good taste and care about the planet. If you need a small power source for your cottage, RV, or to take with you into the wilderness, there are great options out there. 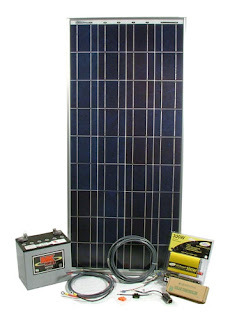 There are solar power kits that include the panel, the electronics, instructions, and all the wiring you need to get started. For example, a kit could power a little stereo, light, and charging your phone down at the boathouse or out in the barn. Or they can keep your RV battery charged as you travel around the country. You'll need a screwdriver, the ability to follow instructions, and a sunny place for the panel. Many of the kits start at less than $100 and for $500 you can get a nice little system and expand it later. So going green doesn't have to break the bank. After all, money is green too right? Full disclosure: I am an employee of Solar Sphere, which sells products discussed in this post. I like these solar energy systems, specially Exterior lightning, Home decor and Garden Decor.... Installing solar energy system is a good option if you want to cut your home bills.